Runs stand-alone And as plug-in via Audio Units, VST 2, RTAS. Mac OSX 10.4.x, G4 1 GHz or Intel Core™ Duo 1.66 GHz, 2 GB RAM. Guitar Rig is your virtual flexible rig. It aims to be your all-in-one guitar and bass solution. If has a wide selection of virtual amplifiers, effects, mics and cabinets. Simply connect your guitar with your computer via the enhanced Rig Kontrol 3 foot pedal and you are ready to go. The on-board studio-quality soundcard routes the signal to your speakers, while the software grants you access to an incredible number of perfectly modeled classic amps, cabinets, mics and effects - all arranged in a super-simple drag-and-drop rack format. Any style, any time - the perfect solution for professional studio and live setups. The latest incarnation of Guitar Rig is a great tool for creating your custom tone. 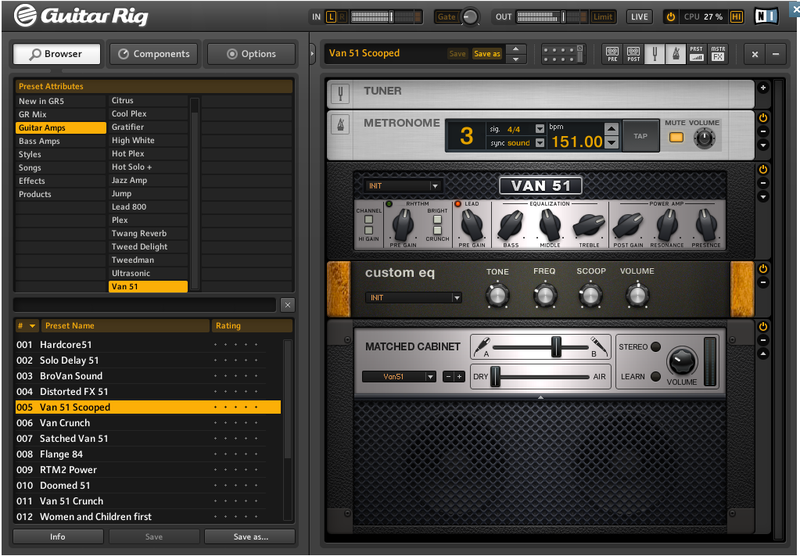 It carries more options like amps, effects and cabinets and which are easy to set up and tweak using Guitar Rig's intuitive virtual effects rack. 12 detailed guitar and bass amp emulations. Matched cabinet module provides tried and true classic sounds in seconds. 44 effects: meticulously modeled stomp boxes, distortion and volume pedals, as well as other popular units. 17 guitar and 6 bass cabinets, 4 rotary speakers and 9 microphones - all based on popular vintage gear. Flexible, intuitive and easy-to-use "rack" concept with drag & drop operation. Intelligent preset management for fast access to a huge selection of ready-to-play sounds for all styles. Essential tools: Integrated tuner, metronome and 2 tapedeck modules for easy recording. Premium special features include a loop machine for on-the-fly jamming, plus modifiers such as LFOs, step sequencers, envelope followers and multi-step envelopes for dynamic signal modulation. Dedicated "Live View" for instant parameter and Rig Kontrol assignment overview. Dynamic Tube Response Technology delivers a "profound sonic quality". Rock-solid foot controller with 8 assignable switches for intelligent "hands-free" software interface control. Snapshot function for real time control of multiple parameters via one switch. Integrated 192 kHz/24 bit USB 2.0 Audio and MIDI Interface with D.I. box, offering crystal-clear sonic quality - no additional MIDI interface or preamp required. Balanced stereo output and separate headphone monitoring. MIDI In/Out and dedicated jack allows extra controller or pedals to be connected. Bug Fix for RTAS crashing on latest ProTools.